The chapter reports on the research and efforts of two faculty members in an Instructional Technologies (ITEC) Master's program to transform their undergraduate and graduate courses into culturally sensitive personalized learning experiences in media literacy education. The 20-year-old ITEC program needed upgrading to meet the paradigm shift in new technologies and global education that its students would enter on graduation. Cultural and social justice issues have been the mission of the University for 40 years and that dimension of media literacy education was missing from the ITEC curricula. Researchers found that introducing techniques of gamification, heutagogical methods, and universal design for learning principles into their online and blended-learning courses provided a way to help students personalize their learning experience and interact more engagingly with each other, and to master the media literacy skills being taught. This chapter describes our improved understanding about how to teach digital literacy and why to undergraduate and graduate students. We are faculty in the Instructional Technologies (ITEC) Master’s program San Francisco State University (SF State). The program is part of the Department of Equity, Leadership Studies and Instructional Technologies in the Graduate College of Education (GCOE). The ITEC program prepares pre-service and in-service teachers, corporate trainers, and a variety of other students in instructional design1 (ID) using technologies. We were both Master’s students in the ITEC program in the 1990s, graduated with our Master’s degree in Education: Instructional Technologies and went on to doctoral programs before returning to SF State. We both held administrative positions and currently are faculty. We both have experience in teaching in various environments and have business experience serving the education sector. Personalized Learning: Addresses individual learners on the basis of their learning styles and needs, and empowers a self-directed learning process. Culturally Diverse Learning: Addresses the cultural/ethnic background of experience, personal perspective, and point of view of every learner. It often infers a broad swath of diverse learners. 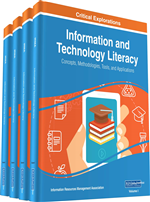 Digital Literacy education requires each learner to grasp unfamiliar terminology, learn skills for unfamiliar tools and interfaces, and apply complex ideas and skills to digital interactions. Digital Literacy involves sophisticated skills and knowledge (see Hinrichs & Coombs, 2014). We realized we could not begin to teach the full set of digital literacies to our students without addressing each individual’s ability to learn and practice them. Our courses would need to re-shape instruction to address culturally diverse, personalized learning perspectives so that we could enhance our learners’ experiences and thereby their retention of the complex digital literacies covered. We knew from our combined experiences in teaching instructional technologies that students responded with more energy and greater interest when they interacted with newer technologies such as games, augmented reality, Wii remotes, and multiple-player or collaborative online challenges. We also knew that many of these technologies would leave some students behind for multiple reasons, such as disinterest in games, lack of technology access, or lack of accommodation for disabilities. Our students must learn the technologies taught in the program and as instructional designers must learn how to incorporate the technologies into instruction. We knew we had to shape our courses to new realities: that technologies for learning were rapidly emerging, that current student expectations about technologies had changed, and that students’ skillsets were different, especially their knowledge of how to operate and apply the newer, emerging technologies. We established the following goal for our studies that would seek students’ increased knowledge in digital literacies by applying methods to improve their personal learning and by giving them culturally relevant experiences in the courses.